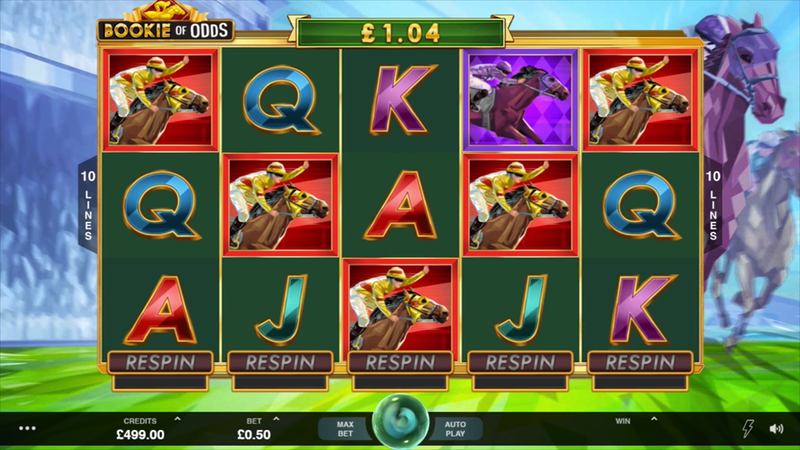 Bookie of Odds is a crossover between a classic video slot machine and a horse racing experience designed by Microgaming and placed on the layout with 5 reels, 3 rows, and 10 fixed paylines. Packed with rewarding features such as Wilds, Scatters, re-triggerable Free Spins, and the unique Respins Feature, this is a game where you can score a static jackpot of 5000x your stake by betting on a winning horse. If interested to find out the details, keep reading our Bookie of Odds slot review. Tired of reading? See the Bookie of Odds screenshots below and then claim one of the bonus offers of our recommended casinos to play for free or real! As one of the most prominent factors in the industry, the publisher made sure you can play for fun or for real money, depending on your ambitions and betting strategy. For a given purpose, they also provided a plethora of demo credits, so you can use them all and learn how to win by paying nothing in front. The only thing that differs the Bookie of Odds Free Play from standard cash game is that your prizes will be paid in demo coins. All other rules remain the same, including the major premise: try to match up 3 or more symbols of the same kind on adjacent reels and collect the prize according to the paytable. Red, Purple, Green and Blue jockey are symbols with the highest payout rating and you will receive a significantly higher amount of cash for 3 to 5 of a kind than it would be the case when you get the same number of playing cards from Tens to Aces. Each reel comes with the Respin Feature that allows you to buy an extra spin at the indicated price. Basically, this option enables an indefinite number of Bookie of Odds Free Spins presuming your bankroll is strong enough and the Lady Luck is on your side. When the feature is turned on, the selected reel will start spinning, while inactive ones remain silent. According to your betting strategy, turn a single reel or all 5 chasing for the big win. Activate the Bookie of Odds Bonus rounds with 3 consecutive Respins. This way, you will receive up to 25 extra spins and 3 or more Book Wilds. Throughout the feature, Wilds are transformed into Sticky Wilds remaining their positions for as long as you keep winning. When at least 3 appear on the reels, lucky winners will receive 10 additional rounds. A few tips: your chances to re-trigger extra spins are much higher in this round thanks to the Sticky Wilds. 3. What is the RTP factor of Bookie of Odds? The official RTP info is still to be disclosed by Microgaming. Soon after, we will update the Bookie of Odds tutorial. As the Bookie of Odds recension showed, the game has what it takes to hold you tight during long sessions. With its attractive jackpot and a chance to play more than a few times at the casino’s expense, this is a title recommended to the widest audience.